The contemporary political climate in the US and beyond might seem inimical to community building across difference, yet within our various experiences, views and forms of knowledge, novel ideas can be found. Forging discussions across difference starts with an awareness that all projects are always in progress. By starting with the questions we ask in our research we aim to contemplate the new directions, opportunities, and challenges found in building across differences that present themselves from both within and without the field of anthropology. This spring, the University of Texas at Austin’s Anthropology Graduate Student Association (AGSA) will hold its tenth annual graduate student research conference, New Directions in Anthropology, on April 7-8, 2017. New Directions in Anthropology highlights the work of junior scholars by providing a forum to come together, share ideas and research, and discuss the future of respective projects. As the conference enters its second decade, the focus this year will be on questions that count: discussing new directions in anthropology within the contemporary political climate in all four subfields of anthropology. Our hope is that New Directions can be an inclusive space where young scholars dare to engage in the exploration of bold new questions, together. The conference itself will be a collaborative effort to define and work through what is at stake in the study of anthropology today. In this way, the conference aims to foster engaging and innovative dialogue around the field of anthropology and beyond, as well as provide participants a platform to explore new questions in their research and their discipline. The overall goal of this conference is to foster community amongst students from multiple fields and to provide a supportive environment where individuals can both share and receive feedback on their current innovative research. Participants will be invited to workshop their projects together ahead of the conference. Dr. Courtney Morris is an assistant professor of African American and Women’s studies at Pennsylvania State University. Her work focuses on black women’s social movements in Latin America and the Caribbean, specifically examining Afro-Nicaraguan women’s political activism in post-Sandinista Nicaragua. She received her PhD in Anthropology at the University of Texas at Austin. While at the University of Texas at Austin, she co-founded the New Directions in Anthropology graduate student conference. All topics that utilize anthropological methodologies or address some aspect of human experience and existence are welcome. 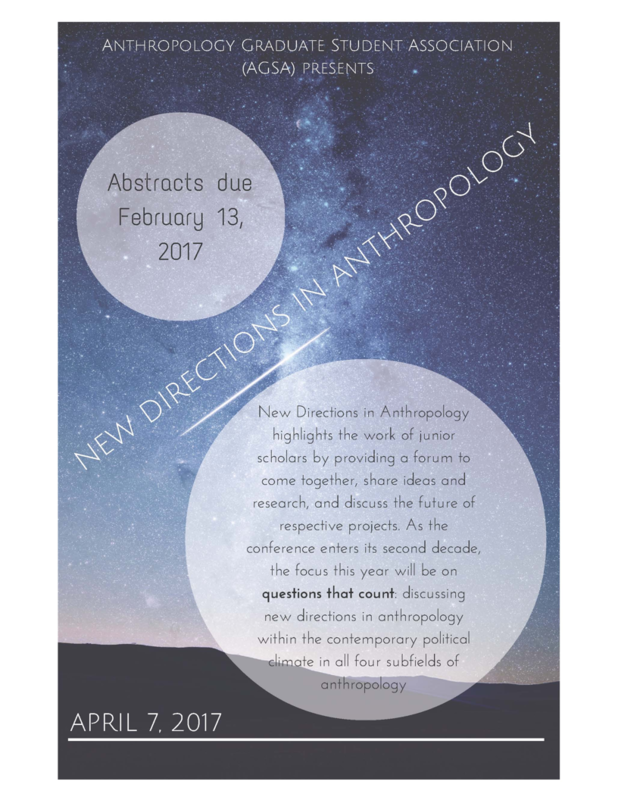 In order to encourage all possible new directions in anthropology, we encourage participants to submit papers that engage with the four fields of anthropology: archaeology, biological anthropology, linguistic anthropology, and sociocultural anthropology. In addition to paper and poster presentations, the 2017 conference will close with a storytelling night in which participants are invited to share stories and performance pieces inspired by their research and daily experience. Submissions for either poster or paper presentations from all subfields of anthropology are welcome and encouraged, as are submissions from graduate students working in related disciplines in the social sciences and humanities. Please submit an abstract of no longer than 300 words to newdirectionsconf17@gmail.com by February 13, 2017 to participate in the conference. We are also accepting proposals at this time to participate in our storytelling and creative showcase, to be held Saturday, April 8. All forms of oral narrative and performance are welcome. Notification of acceptance will be sent by the end of February.